Chrystia Freeland, Canada's Minister of Foreign Affairs, outlined the country's retaliation plan on Thursday. She said that Canada will place tariffs on American goods, including steel and aluminum. Some products will be taxed 10% and others 25%. Up to about $12.8 billion will be subject to the tariffs -- the total value of last year's Canadian steel and aluminum exports to the United States. During a press conference, Freeland called the retaliation "the strongest trade action Canada has taken in the post-war era." "Let me be clear," Canadian Prime Minister Justin Trudeau said. "[The US] tariffs are totally unacceptable." He called them an "affront" to the security partnership between the United States and Canada, adding that it was "inconceivable" that trade with Canada could pose a threat to the United States. "These tariffs are an affront to the longstanding security partnership between Canada and the United States and, in particular, an affront to the thousands of Canadians who have fought and died alongside their American brothers in arms," Trudeau said. Thursday marks the beginning of a 15-day consultation period, during which Canadians are encouraged to weigh in on the list, which may be refined. President Donald Trump and his team say the tariffs are being levied to protect American national security interests. Others do not agree. "This is protectionism, pure and simple," said Juncker. Trump's decision to target Europe and America's neighbors comes as trade tensions with China are escalating again after he tore up a truce agreed earlier this month. The European Union has said that its retaliatory measures, which could be in place as soon as June 20, would include 25% tariffs on American products including motorcycles, denim, cigarettes, cranberry juice and peanut butter. European officials said the tariffs were designed to be "proportionate." "Today is a bad day for world trade," said EU trade commissioner Cecilia Malmström. "We did everything to avoid this outcome." 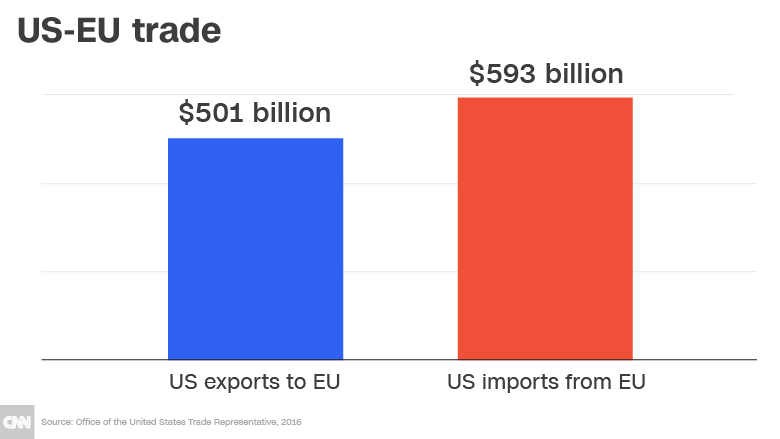 Trade between the US and European Union exceeds $1 trillion annually. The United States is the world's top steel importer. The value of steel shipped into the United States was just over $29 billion in 2017. Mexico and Canada are both top providers of US steel imports. The Mexican government said that the US action was not justified, and that it would retaliate with its own comparable penalties on US products including lamps, pork, fruit, cheese and flat steel. The new US tariffs on steel and aluminum are set to go into effect on Friday. 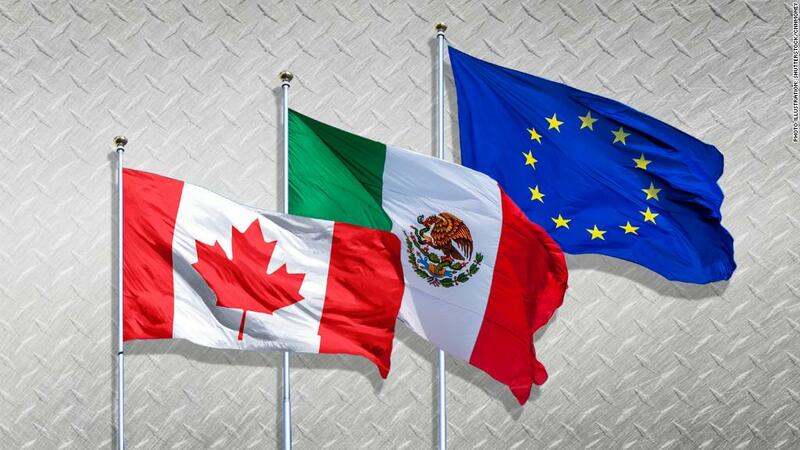 They could complicate ongoing negotiations between the US, Canada and Mexico on modifications to the North American Free Trade Agreement (NAFTA). The Trump administration surprised observers on Tuesday by announcing it would impose tariffs on $50 billion worth of Chinese goods and restrict Chinese investment in the United States. China has said it is ready to retaliate, the latest escalation of a conflict that has lasted more than a year. "We want to reiterate that we don't want a trade war, but we aren't afraid of fighting one," said a spokesperson at China's foreign ministry. 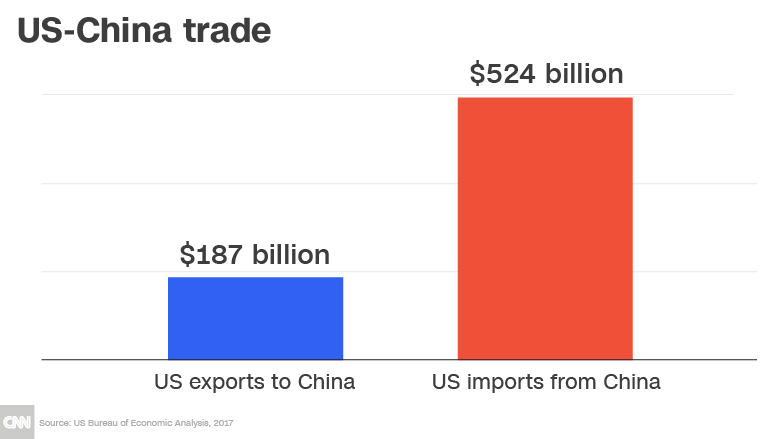 President Trump wants China to buy more goods and services from the US. Steel industry groups called on politicians in affected countries to defend their companies and workers. Eurofer, the European Steel Association, asked EU leaders to "react accordingly with appropriate and proportionate measures." It asked officials to protect the region's steel market, warning that excess steel that would otherwise have been sold in the United States could push down prices at home. -- Julia Horowitz, Chris Liakos and Danielle Wiener-Bronner contributed reporting.